One of the best ways to find out about Leckhampton’s rich history is to join the Leckhampton Local History Society. 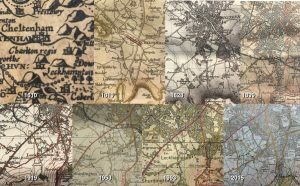 Cheltenham Local History Society also publishes articles about Leckhampton from time to time and both societies’ journals are online. Local historian Eric Miller’s ‘Leckhampton in a nutshell’ is a particularly good introduction which you can find on the LLHS pages here (along with his excellent explanation of why you shouldn’t believe all that nonsense about Kidnappers Lane having anything to do with goats). The first human hunter-gatherers – Neanderthals or other early human species rather than modern humans – probably reached this area 400,000 years or even longer ago when our island was still connected to the European mainland. But human occupation was repeatedly beaten back by ice ages which buried the country further north and west in solid ice. At its last great extent some 20,000 years ago, the ice sheet might just have been visible across the valley from our hill. 12,000 years ago, another cold period was ending, allowing human settlement to resume in earnest – and by now ours was the only surviving human species. The earliest evidence of settlement in our immediate area has been found just south of modern Leckhampton at Crickley Hill where the first village is thought to have been inhabited by farmers some 5,700 years ago – before even Stonehenge was built. By three thousand years ago there were new iron age fortifications there and on top of what we know and love as Leckhampton Hill. 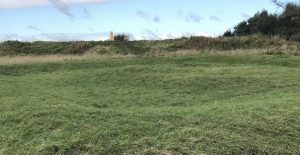 Their ramparts and possible burial mounds are still visible today and evidence of scorched defences suggest violent and insecure times but we still know little of their language or society. We know more about the Roman legions led by the future emperor Vespasianus who reached the west country within a year of their invasion of Britain in the reign of the Emperor Claudius, in our year 43. They found this area inhabited by a British tribe they called the Dobunni. Roman rule must have brought relative peace and security and their villas eventually dotted the surrounding countryside. Large Roman settlements developed at Glevum (Gloucester) and Corinium Dobunnorum (Cirencester), linked by a major road whose dead straight lines are still obvious as Ermin Street and the A417 just south of Leckhampton. Roman coins and pottery have been found all over the area. In the fourth century Christianity would have been practised here for the first time as the new state religion of Rome. But with the empire in increasing turmoil, the Romans departed again in the early fifth century leaving the British to “look to their own defences” in the famous words of the Emperor Honorius. Invasion and migration from the continent by Angles, Saxons and other germanic tribes was not long in coming to the east of the country but took longer to reach out west where there is good evidence that most of the indigenous British people, their language and even the Christian religion survived the arrival of pagan Anglo-Saxon overlords. In 577 chroniclers record a major victory for Ceawlin, the king of the growing Anglo-Saxon kingdom of Wessex, who took the nearby Romano-British towns we know as Gloucester, Cirencester and Bath. Our area initially formed part of a Saxon territory called the Hwicce, sandwiched between Wessex and its great rival Mercia to the north. By the seventh century, the Hwicce was firmly under Mercian overlordship. In 628 the aggressive new king of Mercia, Penda, pushed as far south as Cirencester where he fought and “came to terms” with the forces of Wessex. Although Penda worshipped Woden and the old gods until his death in 655, his son and eventual successor Wulfhere was Christian as was the Hwiccan royal family and before long Christianity was re-establishing itself as the official religion and pushing to convert the populace as well. Relative peace under Mercian rule lasted some centuries and Mercian boroughs like Winchcombe prospered and became important military and administrative centres. By the ninth century, Leckhampton below the hill was an established Anglo-Saxon settlement and would soon have its own Christian church dedicated to St Peter. The name Leckhampton, variously spelled, is probably formed from the Anglo-Saxon words for market vegetables (leek), meadow (hamm) and enclosure or settlement (tun) and reflects the good use made over the centuries of the rich local soil. But the ninth century also saw new waves of pagan Danish and Norwegian invaders conquering the north of England and then dismembering Mercia, leaving the ‘English’ united under the House of Wessex. The old Mercian sub-kingdom of the Hwicce gradually passed into history as Wessex imposed its own military and administrative system on English Mercia, placing Leckhampton in the Hundred of Cheltenham and the County of Winchcombeshire. The county never fell under the ‘Danelaw’ but Danish armies and raiders battled Saxon forces as nearby as Gloucester and in 1015 a huge Danish force ravaged England again, including Winchcombeshire. A truce was finally reached in nearby Gloucestershire in 1016 between the Saxon King Edmund and the Danish King Cnut who would succeed to the whole kingdom the following year. In 1066, the Saxon king Harold – finally king of all England and free of Danish royalty and raiding parties – was displaced by yet another conqueror of norse descent, William of Normandy. The new regime set about recording their territory in fine detail. Two manors are recorded in the 1086 Domesday Book entries for Lechametone and Lechantone which William had by then assigned to two loyal Saxon lords, Brictric and William Leuric. Leckhampton is listed alongside Prestbury, Swindon (Village) and Cheltenham itself within the Cheltenham Hundred, then completely rural but with boundaries similar to the modern town, and the county of Gloucestershire which had absorbed its neighbour Winchcombeshire. The Leckhampton manors included seven hides of land between them (one hide is approximately 120 acres) and were worth the princely sum of 70 shillings. There may have been a third manorial estate of one hide of land, worth 15 shillings belonging to one Humphrey the Cook, named Lechetone in Domesday which seems to have placed it wrongly in the nearby Slaughter hundred. A fine stone font remains at St Peter’s from the Norman era. Across Church Lane a moated site and two fishponds date from at least the 12th century and are now Leckhampton’s only scheduled monument. Brictric appears to have been thrown into prison by King William but life in Leckhampton continued and by the early 12th century the manor was in the hands of Simon Despenser, a member of one of the most powerful and often hated families in England during the violent and unstable centuries that followed. Battles raged around the county during the 12th century civil war between Stephen and Matilda, the 13th and 14th century baronial wars and then the 15th century Wars of the Roses. Many Despensers met sticky ends but, perhaps mercifully for Leckhampton, the early 14th century saw the lordship of the manor pass to the Giffard family, established Norman landowners based at Brimpsfield. In the 1320s Sir John Giffard is credited with building the stone hall which is the oldest surviving part of Leckhampton Court, much enlarged over subsequent centuries and now the Sue Ryder Care hospice. 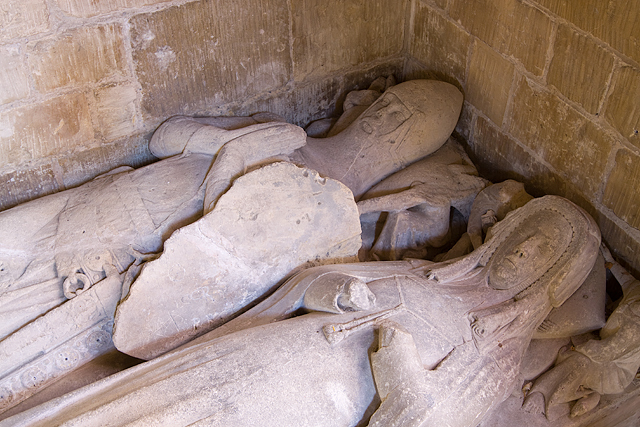 Sir John and his good lady wife are remembered in fine stone effigies still in the church today. In 1486 another John Giffard died without a male heir, leaving the manor to his daughter and her husband John Norwood, whose family held the lordship of the manor for more than 300 years and is still recalled in the names of Leckhampton streets, pubs and chippies. Landowning and the new American colony of Virginia were kind to the increasingly prosperous Norwoods. Only Colonel Henry Norwood, born in 1614, almost came a cropper, nearly drowning off North Carolina and being sent to the Tower and then into exile for supporting the crown during the Civil War. Back in favour after the restoration of the monarchy, Henry bought Leckhampton Court and the lordship of the manor from his cousin Francis Norwood and took up residence in 1669, later becoming both mayor and MP for Gloucester. By the 17th century, Leckhampton Court was the grandest manor house in the area and Leckhampton had a settled parish boundary stretching from the top of the hill as far as Warden Hill, Westal and Merestones. This wasn’t far from Leckhampton’s larger neighbour Cheltenham, a steadily growing market town which had acquired its own grammar school in 1574, almshouses and a number of inns and whose population now included many tradesmen and craftsmen as well as farmers. Still agricultural Leckhampton’s population in the religious census of 1676 was estimated at just 130 compared to Cheltenham’s 1,670. Shadows of the traditional ‘ridge and furrow’ cultivation of the land are still visible on the open fields just below the hill on a sunny evening. Leckhampton’s only other industry was the extraction of the hill’s golden limestone for building, which had begun to give the hill its distinctly man-made profile. The 18th century saw Cheltenham suddenly develop a new life as a spa resort following the discovery of apparently health-giving waters there in 1716 and the creation of a “handsome walk and additional buildings” by Henry Skillicorne around 1740. By 1786 commissioners were being appointed to pave, light and clean Cheltenham’s streets – and raise a rate to pay for it. Little changed up in rustic Leckhampton, except for creeping enclosure of the common fields, until 1797 when the last of the Norwoods, Henry Norwood, died without a direct heir and left the manor and Leckhampton Court to his cousin, the eminent Gloucester surgeon Charles Brandon Trye. The forward-looking Trye, already a champion of his friend Edward Jenner’s ‘vaccination’ and of relief for poor women in childbirth, was determined to join in the ‘improvement’ of the area and later became a Cheltenham commissioner himself. In Leckhampton, Trye experimented with new cultivation techniques, formally opened up the hill’s quarries to commercial exploitation and built what seems to have been Gloucestershire’s first railway – a gravity-assisted tramroad on the hill. By 1810 the tramway passed today’s Scout hut and connected the hill’s quarries to Cheltenham and by 1811 to Gloucester. The carving out of the railway ‘incline’ for the trams also isolated a distinctive pillar of rock which remains a Leckhampton icon to this day: the Devil’s Chimney. The thrust for improvement continued in the new century. In 1800 the only major road in the area was the old Bath Road which had taken George III off to Bath after his famous visit to Cheltenham in 1788. By 1820, a new Bath Road connected Cheltenham and Leckhampton Hill (the upper part later becoming Leckhampton Road). Another new toll road branched off towards Shurdington in 1822 forming the distinctive fork in the roads which would now highlight Leckhampton in every future map of the town. Leckhampton’s relative isolation from its big neighbour Cheltenham was drawing to a close. Charles Brandon Trye, elected a Fellow of the Royal Society in 1807, died in 1811. His younger son, also Charles Brandon Trye and equally energetic, picked up the rectorship of St Peter’s in 1830 before buying the manor from his older brother in 1842. He held the rectorship for an astonishing 54 years, established the first local school in Hall Road in 1840 and ‘improved’ the church in 1834 and 1866, albeit at the expense of some of its Norman and medieval features. The 19th century transformed Leckhampton. Tramroads were eclipsed by steam railways, Leckhampton finally acquiring its own station just off Leckhampton Road in 1881, courtesy of the Banbury & Cheltenham Direct Railway Company (sold to the Great Western Railway in 1894). The railway crossed the Shurdington Road just beyond the new Moorend Road, and passed under the Old Bath Road at Pilley Bridge. Not long before Pilley had just been a Saxon fieldname east of Leckhampton village but it would become a small hamlet popping up on maps in its own right and featuring one of the area’s several new clay, brick, tile and pottery works. Victorian brick housing began to spread from Cheltenham’s South Town around the new Bath Road and right up the Leckhampton Road to Pilley. A private leisure garden and boating lake opened right next door to the new station at Liddington Lake exploiting former clay pits to provide a cheap and popular day out, including ice skating in winter. It lasted until 1912. Denser terraced housing was soon filling in the triangle formed by the Moorend, Shurdington and Leckhampton Roads, built for working class families who would probably be amazed at its modern ‘bijou’ reputation (and prices!). Cheltenham acquired its own MP in the Great Reform Act of 1832 and a borough council in 1876 but most of Leckhampton was still outside its political boundaries. The 1891 census gave Leckhampton Parish’s population as 3,363 and Cheltenham’s as 42,914 but the parish still included much of South Town and Fulwood Park (today’s university Park campus) as well as the built up area north of Moorend. In 1894 local government reorganisation halved the parish in size and transferred almost all of this population into the south of Cheltenham. Leckhampton village became part of Cheltenham Rural District Council but also acquired an elected parish council of its own (which has just this year expanded again to reunite the area between Moorend and the Norwood Arms with the rest of the historic parish). 1894 also saw the sale of much of the Leckhampton estate. The later Trye family’s lifestyle had often exceeded the dwindling profits from tenant farming and quarries and Henry Norwood Trye finally sold up, the last of the three interconnected families that had occupied Leckhampton Court since the 14th century. The manor house took on various guises in its later years, as a Red Cross hospital in the Great War, private home, GI billet and German PoW camp in World War II and then a school before falling into near dereliction. It had the fantastic good fortune to be acquired in 1977 by Lady Sue Ryder’s charity which has shown almost as much care for the grand old building and its history as for their hospice guests. The 1894 sale placed the land including Leckhampton Hill itself in the hands of one Henry Dale and ushered in probably the most extraordinary and celebrated episode in Leckhampton history. A sharp businessman and supplier of fine Dale Forty pianos, not least to the Cheltenham Ladies’ College established in 1854, Mr Dale made clear his intention to stop traditional rights of way across the hill that had been enjoyed for centuries. In 1897 he built Tramway Cottage on Daisybank Road, right on the site of a traditional holiday fair and picnic spot. In 1899 he began fencing off the hill above Daisybank. The Rural District Council proved spineless in opposition and Dale closed off more and more footpaths onto the hill. Local opposition grew. Dorothea Beale, the formidable headmistress of the Ladies’ College, was in the habit of sending her girls up the hill from the school’s Leckhampton sanatorium for fresh air and exercise. She firmly ordered them to keep doing so while “behaving as ladies” and ordered Mr Dale to remove his pianos from her establishment. On 8 March 1902 less decorous crowds began tearing down the fences, eventually including those around Tramway Cottage. Four ringleaders, who had been meeting at the Wheatsheaf Inn, were arrested for obstructing the police and were soon nicknamed the ‘Leckhampton Stalwarts’. They included the ‘King of the Common’, Pilley brickworks clay digger Walter Ballinger. On 15 July – probably to their own surprise as well as Dale’s – they were all acquitted. The subsequent celebration turned into a march on the hill. Tramway Cottage was razed to the ground and, in a nice modern touch, the Stalwarts posed for photographs on the ruins. But Dale took his case to court in London, won and, despite huge opposition in Cheltenham, began rebuilding the cottage and enclosing the hill all over again. The protests carried on, fences were burnt and on Good Friday 1906, the Stalwarts and a crowd of thousands marched “up on the Hill to down Dale!” and attacked Tramway Cottage again. The Riot Act was read, the crowd dispersed and this time Ballinger and six other working men were sentenced to hard labour. The campaign was over. For the time being. After the Great War, Dale’s Leckhampton Quarries Company planned a spectacular expansion, building innovative new lime kilns halfway up the hill served by a massive new railway incline passing under Daisybank Road, for a while turning the hillside into an industrial wasteland. They enthusiastically began dynamiting parts of the hill for limestone, reminding some horrified residents of wartime barrages. But the kilns never really worked, the railway was hardly used in the end and the company went bankrupt in 1925. The land on the hill was snapped up for the bargain price of £6,500 by Cheltenham’s town council. The mayor officially declared the hill open to the people again in September 1929. The Echo called it “one of the great days in the history of Cheltenham”. Walter Ballinger, now a survivor of the western front as well as hard labour, was in attendance. More housing had already spread across the old Leckhampton estate, beyond Moorend, down the Shurdington Road and around Church Road. A bigger new school building in Hall Road had opened in 1906 and was enlarged again in 1931. In 1930 the nearby fields of Moorend Grove became a staff sports ground for the thriving co-operative publishing firm founded by noted local etcher, artist and archaeologist Edward J Burrow who was also an early excavator of the iron age hillfort on Leckhampton Hill mentioned above. Burrow’s Field was later acquired by the council for public sporting use. Leckhampton was fast becoming a busy suburb of Cheltenham albeit retaining its unique village feel, rural road layout and at least some of its ancient fields as well as its hard-won access to the hill, where the old quarries and inclines were softening into a wooded landscape. The rest of the 20th century was undramatic except for the devastating German air raids of late 1940 when Luftwaffe bombs landed in Pilley Crescent, Burrow’s Field and the allotments next to the primary school in Hall Road. The most devastating raid on Cheltenham on 11 December killed 23 people and left 600 homeless across the town. It also took out Pilley Bridge which then became notorious as the slowest post-war bridge repair in the country, leaving locals to ‘walk the plank’ of a temporary wooden bridge until 1954. Leckhampton Primary took in 22 evacuees alongside local children and dug air raid trenches in the playground while Leckhampton Court and nearby Ullenwood billeted large numbers of British and American troops. In 1962, the railway line and station closed in the face of increasing use of private cars. The station site provided new employment land and now hosts a thriving cluster of companies. The line itself has been built on in places but below Pilley Bridge it has become a unique urban nature reserve hidden deep in the old cutting. Elsewhere the postwar baby boom and rising population ensured that the relentless pace of development continued, swallowing ancient farmland like Collum End Farm as it became Collum End Rise and the surrounding roads. In 1992 the remainder of the ancient parish was incorporated into Cheltenham borough but retained its parish council as a statutory voice on planning issues and a proactive funder of local improvements from play areas to war memorial repairs. For a while Leckhampton bounced in and out of the Cheltenham parliamentary seat: included in 1983, transferred to the inaccurately named Tewkesbury constituency in 1997 and then finally included in Cheltenham again in 2010. By the 80s, hard-pressed town planners were running out of space within the borough boundary for new housing and developers were eyeing up the last of the low-lying open fields in Leckhampton, now an increasingly precious green space for the urban population and still preserving echoes of the medieval parish’s field patterns and rights of way. Next door Tewkesbury council (with very few electors in the area) developed the unfortunate habit of repeatedly agreeing to development just over Leckhampton’s borough boundary which then inevitably had to be absorbed into Cheltenham and Leckhampton. The latest such development on Farm Lane has finally cut off Leckhampton’s remaining green fields from the open countryside. Campaigners Don Horwood and Kit Braunholtz formed the non-party political Leckhampton Green Land Action Group (LEGLAG) in 1993 which has been fighting to defend these last green fields through popular protests, planning inquiries and court cases ever since. The Parish Council has also taken up this challenge in recent years as it helps to plan Leckhampton’s future. In 2000 the less political Friends of Leckhampton Hill and Charlton Kings Common – FOLK – was formed to involve local people in the active conservation and management of the ecology, geology and archaeology of the land on the hill. The spirit of Walter Ballinger lives on! Leckhampton Local History Society, including online copies of Smoke Signal http://leckhamptonlhs.weebly.com/ and the Research Bulletin, especially RB1 featuring Eric Miller’s Leckhampton in a nutshell, Terry Moore-Scott’s article on Leckhampton’s ancient fields and Amy Woolacott’s research on local place and streetnames. Another of Terry’s excellent articles, on the manors of Leckhampton, can be found on the Gloucestershire History archive site here. Websites of Leckhampton with Warden Hill Parish Council, Leckhampton Green Land Action Group, Gloucestershire Wildlife Trust (for Crickley Hill) and FOLK; Ancient Monuments UK (for the moated site at Church Lane); the Bristol & Gloucestershire Archaelogical Society’s Lloyd George Survey of Land Values: Gloucestershire; the Ancient Human Occupation of Britain website, British History Online (including reference to Burrow’s excavation at Leckhampton); the Trase (UK) Ltd Cheltenham Local History Pages and the Deakin Family History pages (for biographical details of of Edward J Burrow). Thanks to Eric Miller, Angela France, Terry Moore-Scott and James Hodsdon for editorial and historical corrections and advice. The remaining mistakes are all mine.